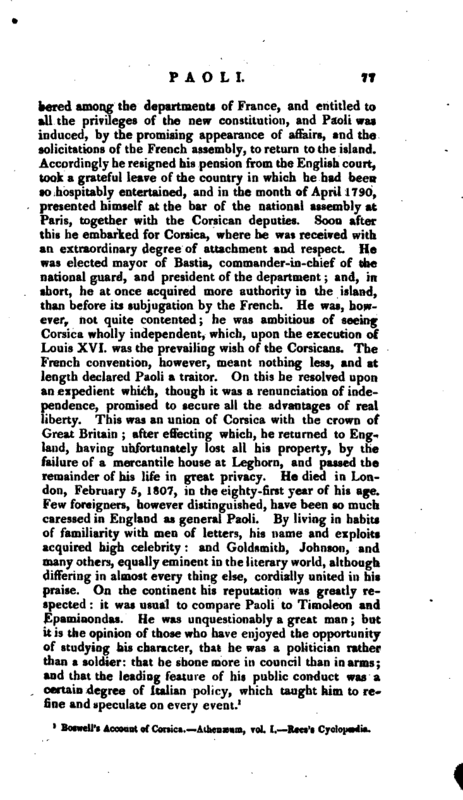 , a very distinguished character in modern times, born at Rostino, in the island of Corsica, in 1726, was the son of Hiacente Paoli, a Corsican patriot, who, despairing of the freedom of his country, had retired with his family to Naples. 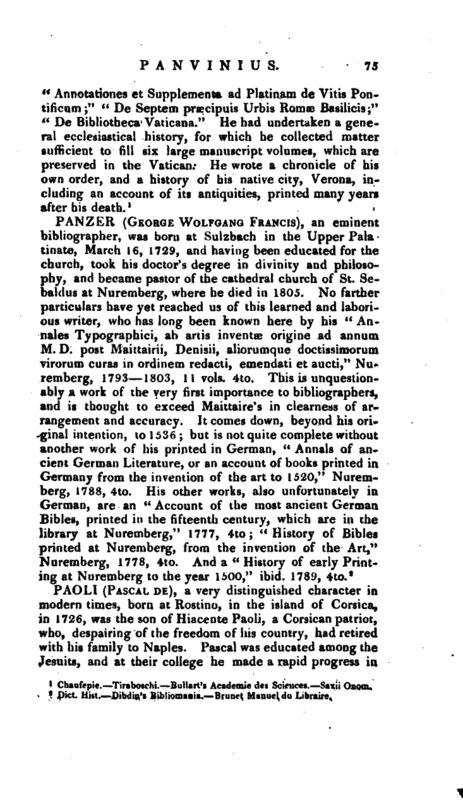 Pascal was educated among the Jesuits, and at their college he made a rapid progress in | his studies, and displayed an understanding equally solid and capacious. He appeared in so favourable a light to his countrymen, that he was unanimously chosen generalissimo, in a full assembly of the people, when he had attained but to the 29th year of his age. He began with new-modelling the laws of Corsica, and established the appearance, if not the reality, of subordination: he also instituted schools, and laid the foundation of a maritime power. 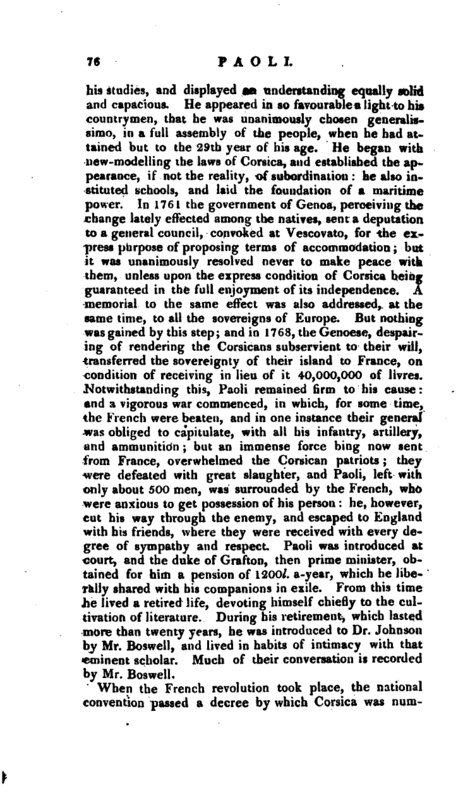 In 1761 the government of Genoa, perceiving the change lately effected among the natives, sent a deputation to a general council, convoked at Vescovato, for the express purpose of proposing terms of accommodation; but it was unanimously resolved never to make peace with them, unless upon the express condition of Corsica being guaranteed in the full enjoyment of its independence. A memorial to the same effect was also addressed, at tfie same time, to all the sovereigns of Europe. 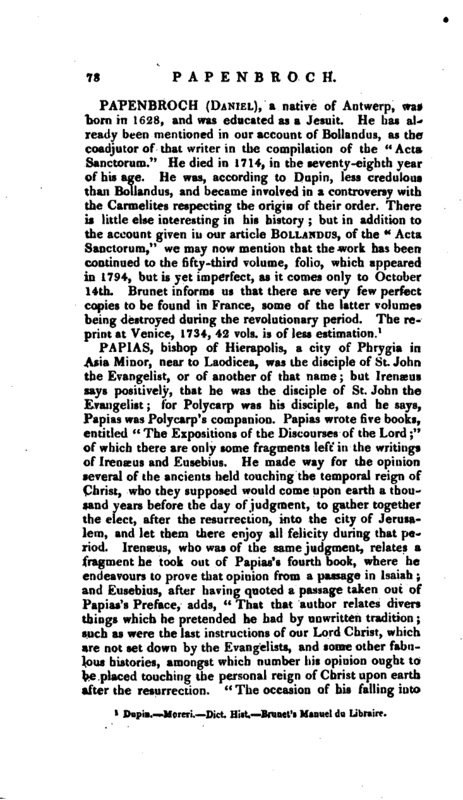 But nothing was gained by this step; and in 1768, the Genoese, despairing of rendering the Corsicans subservient to their will, transferred the sovereignty of their island to France, on condition of receiving in lieu of it 40,000,000 of livres. Notwithstanding this, Paoli remained firm to his cause: and a vigorous war commenced, in which, for some time, the French were beaten, and in one instance their general was obliged to capitulate, with all his infantry, artillery, and ammunition; but an immense force bing now sent from France, overwhelmed the Corsican patriots; they were defeated with great slaughter, and Paoli, left with only about 500 men, was surrounded by the French, who were anxious to get possession of his 'person: he, however, cut his way through the enemy, and escaped to England with his friends, where they were received with every degree of sympathy and respect. Paoli was introduced at court, and the duke of Grafton, then prime minister, obtained for him a pension of 1200l. a-year, which he liberally shared with his companions in exile. From this time he lived a retired life, devoting himself chiefly to the cultivation of literature. During his retirement, which lasted more than twenty years, he was introduced to Dr. Johnson by Mr. Boswell, and lived in habits of intimacy with that eminent scholar. Much of their conversation is recorded by Mr. Boswell.